Forklifts, like most operating equipment, require daily checks to avoid unexpected and undesirable maintenance and costs, and to keep your operators safe. Overlooked issues can turn into larger problems, create major malfunctions, and create an unsafe environment. Thus, operators should inspect the forklift truck every day before using it, or before each shift. OSHA requires daily pre-shift maintenance checks on forklifts, and operators must be OSHA certified. Atlantic Lift can get you started on your certification with their OSHA-approved certification classes, allowing you to operate any of our new, used, and rental lift trucks that come in a variety of models. 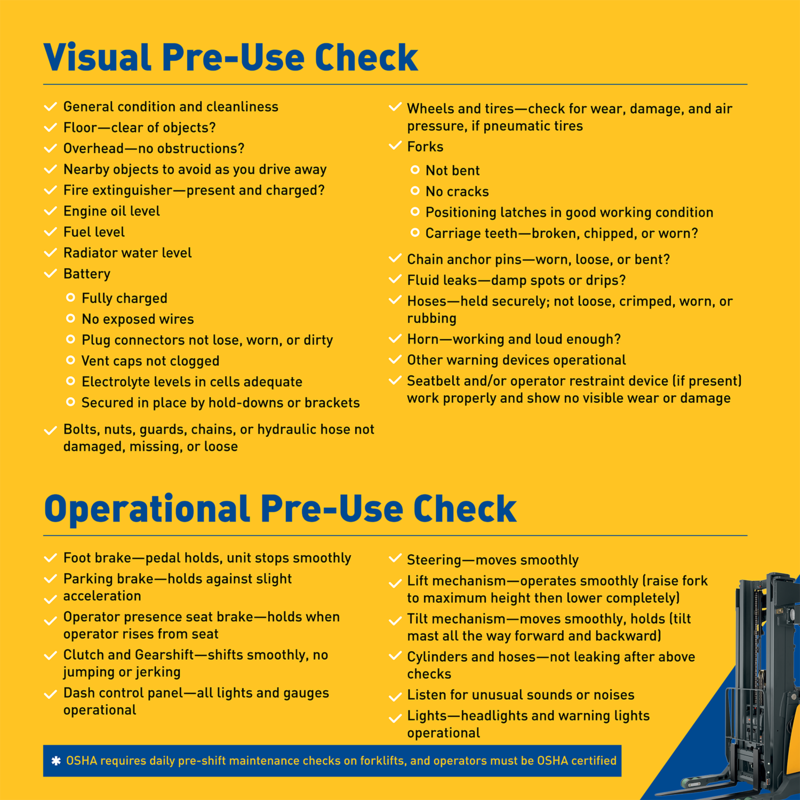 A list of daily checks will help your operators know the condition of the forklift. It will allow them to know their equipment is running well, or whether it needs further inspection or maintenance. The operator should carry out a visual check (“circle” check) before starting the forklift. After completing the visual pre-start check, the operator should do an operational pre-use check.